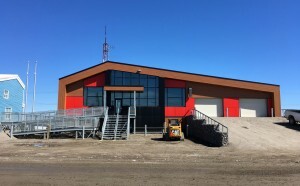 The new RCMP detachment in Arviat, Nunavut is nearing completion. The majority of the construction work is completed, and commissioning work is underway. Building occupancy is scheduled for late summer, 2018. The RCMP’s presence in the Arctic has been long-standing; however, its physical image as a community service has not been updated in nearly 40 years. The current detachment was undersized and had outlived its use as a functional building. Parkin’s design approach for the new detachment provides a compact and efficient facility, while addressing the environment and construction challenges of the Arctic. The building program provides staff and support areas, a secure zone including holding cells, and two garage bays, to meet the RCMP’s functional requirements. The front of building contains a large open interior space from which the public has access to various areas the building. Adjacent is the staff bullpen, separated by a partially glazed wall, promoting a welcoming but secure area between the public and staff areas. Parkin’s goal was to ensure that the RCMP’s mission, vision and values are represented through this new facility. We look forward to establishing a basis for protective services design in the Arctic.